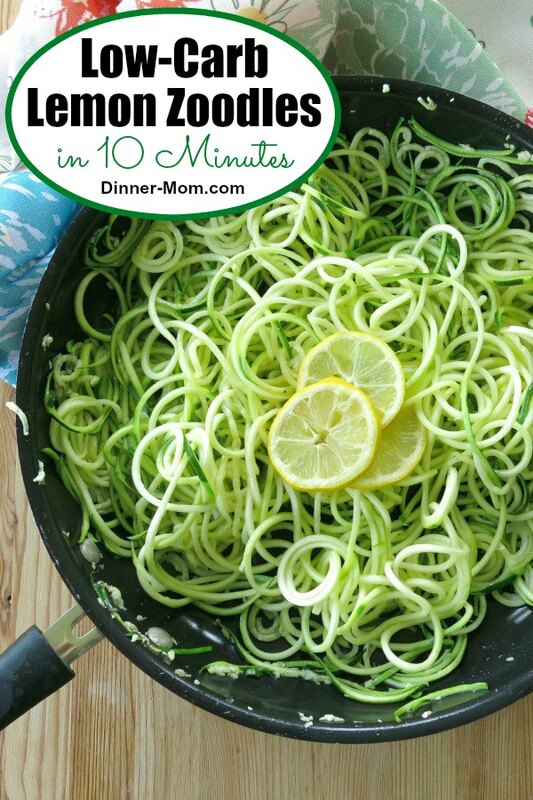 10 Minute Lemon Garlic Zucchini Noodles are the perfect side dish for your seafood, chicken or beef dinner. They pair perfectly with just about anything you place next to them! A low-carb, gluten-free alternative to pasta. Lemon lovers rejoice! Here’s another easy recipe to brighten up your dinner table. I know there are lots of lemon fans out there because you’re devouring Baked Lemon Pepper Chicken, Lemony Baked Basa and Lemon Pepper Tilapia like crazy. And, I totally get it! A fresh squeeze of lemon perks anything up. I learned this tip at a cooking demonstration from Sara Moulton many years ago and it has never failed me. Turns out zucchini noodles sauteed in olive oil and garlic (and butter if you are so inclined) are fantastic with a splash of lemon juice. 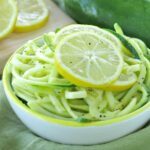 Spiralize several pounds of zucchini as part of a weekly meal prep routine so you can make Lemon Garlic Zucchini Noodles, Zucchini Noodle Alfredo, Garlic Parmesan Zucchini Noodles or any other zoodle variation at a moment’s notice. The more you make zucchini noodles, the faster and more creative you will become. Here are some tips from our kitchen. 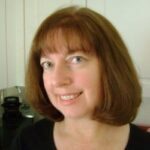 We’ve referenced ingredients and tools we love and you can find links to them in our Amazon Store. 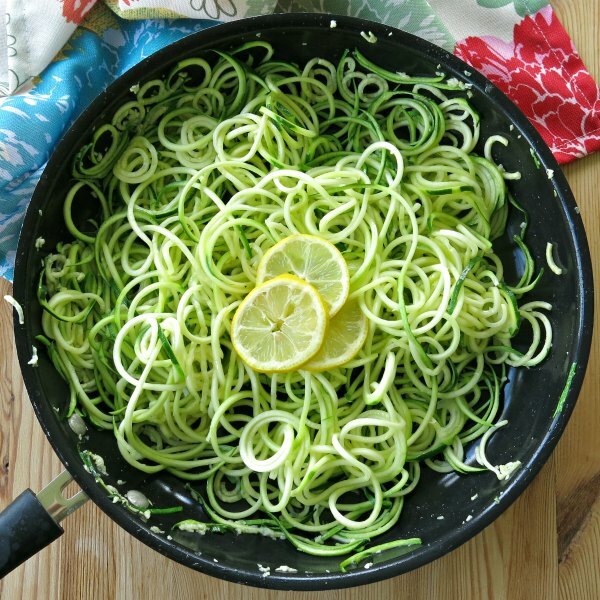 Use a spiralizer or vegetable peeler to make long zucchini noodles. Zucchini is easy to work with and a hand held gadget does the job easily. Plus, it’s quick to clean. There’s no need to peel the zucchini first, the skin is good for you and adds color. Depending upon your preference, make zoodles thin or thick. The difference is minimal for manual spiralizers. However, you may end up cooking thicker noodles for an extra minute. Cut long strands of zucchini with kitchen scissors so they are easier to work with. 2 pounds of zucchini will yield an amount that fits perfectly in a large skillet without crowding the zucchini. This amount will feed about 4 as a side dish. The end goal when cooking zoodles is to make them crisp tender and never soggy. Make Lemon Garlic Zucchini Noodles in batches to serve more people or for larger serving sizes. Rubber tongs are very helpful to turn zucchini noodles while they are cooking. Use a garlic press to quickly mince fresh garlic. There’s no need to peel garlic cloves first using this method! Substitute a pinch of garlic powder for 1 garlic clove if desired. Replace butter with olive oil to make this recipe dairy-free. Or, use a vegan butter alternative. Saute zucchini noodles for 3-5 minutes. To avoid soggy noodles, keep the cook time short so they zucchini noodles stay firm. I almost always err on the side of 3 minutes. In fact, it’s ok to eat zucchini noodles raw, but they taste much better warmed up in my opinion. Use these tips to up the intensity of the lemon flavor in Lemon Garlic Zoodles or for any recipe that needs freshening up! Fresh lemons are the best! A medium-sized lemon yields 2 – 3 Tablespoons. Add a little extra lemon to taste or serve with wedges. Zest the skin and sprinkle it over the zoodles for a more intense lemon flavor. We love Nellie and Joe’s Key West Lemon Juice too. For a stronger lemon flavor sprinkle Lemon Garlic Zucchini Noodles with Lemon Pepper Seasoning instead seasoning with salt and pepper. Lemon Garlic Zucchini Noodles are best eaten right away. Leftovers become soggy. Make ahead tip: Spiralize zucchini noodles and store them in the refrigerator in an airtight bag or container until you’re ready to use them. They will stay fresh for about 5 days. Blot any wetness away before using in a recipe. We would love to see your version! Please rate this recipe and tag @DinnerMom on social media if you make it! 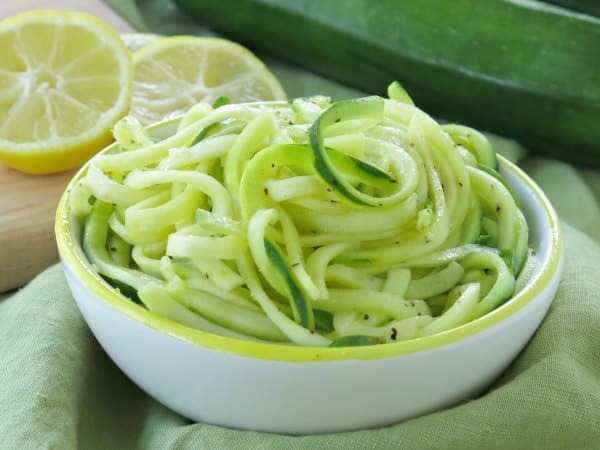 Lemon Garlic Zucchini Noodles are gluten-free, low-carb and are ready in just 10 minutes! Spiralize zucchini into long strands. Set aside. Add olive oil and garlic to skillet and saute until garlic is fragrant, about 1 minute. Add zucchini noodles to skillet and toss to coat with lemon butter garlic sauce. Continue to saute for 3-5 minutes or until desired tenderness. 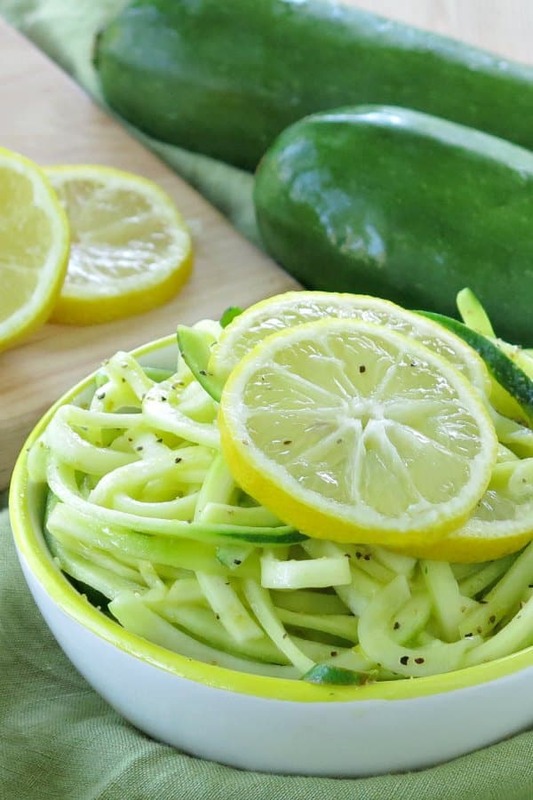 Stir lemon juice into zucchini noodles. I’m always excited to break out my spiralizer! Love the lemon garlic flavor here! I agree that a splash of lemon gives just about any dish that added pizazz! My husband and I enjoy this easy zoodle recipe often and just the other night served it with grilled shrimp. I no longer miss my pasta noodles, these zoodles totally satisfy! It was too lemony. I think cutting the lemon juice and zest would make it better.